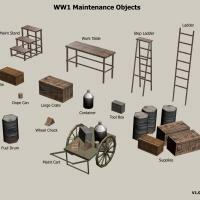 This pack contains all new WW1 maintenance objects. revised the pack to include missing .bmp for the maintenance equipment. Added missing artwork for maintenance objects.